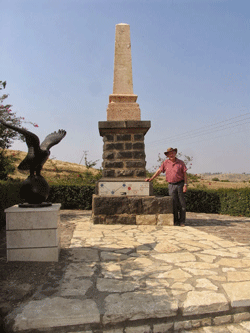 Yerach Paran stands next to the memorial to the fallen Turkish pilots. Photo by Esther Hecht. It was the most daring—and seemingly impossible—mission. On February 8, 1914, when Palestine was still part of the Ottoman Empire, two planes of the fledgling Ottoman Air Force took off from Istanbul. Their destination: the holy city of Jerusalem and, ultimately, Cairo and Alexandria. Their goal: to promote modernity and to boost the morale of the armed forces, thus helping to restore the glory of the dying empire. They would also be delivering the first Ottoman air mail. Aviation was in its infancy, and the planes, flying at about 75 miles per hour, had a range of less than 220 miles. Made of wood and fabric, with wings attached by a single screw, the flimsy aircraft needed frequent refueling stops as well as numerous repairs to make the 13-leg journey of nearly 1,700 miles. The trip got off to a bad start. It was raining in Istanbul and the planes quickly lost each other. One of them, caught in thick fog, nearly hit a mountain. Later, one plane had to remain in Damascus for repairs while the other headed for Jerusalem. On Friday, February 27, tents were set up for a reception in the Talpiot neighborhood where the plane was scheduled to land, and a welcoming crowd waited and waited. But the plane never arrived. Fethi Bey, its crack pilot, and his navigator, Sadek Bey, had only rudimentary instruments and were apparently unaware of the fierce winds that blow across Lake Kinneret in winter. As the plane flew along the lake’s eastern shore, it was buffeted by strong easterly winds, and the vibrations broke the screw that connected the wings. Arab villagers in Samra—serfs on land owned by the founder of the Baha’i faith—saw something fall out of the sky. The plane had crashed. Fethi and Sadek, the first casualties of the Ottoman Air Force, were hailed as heroes in their homeland. But their story might have been forgotten in Israel were it not for the determination of Yerach Paran to preserve their memory—a determination untouched by the vagaries of Israel’s diplomatic relations with Turkey. One hundred years after the crash, Paran, 75, visits the site most Fridays and Saturdays, tending the memorial, about three miles northeast of the Tzemah junction. There he tells the story to visitors attracted to the spot by the cryptic words “Turkish pilots” on a brown sign on the lakeshore road. Paran’s admiration for these early heroes of aviation is palpable. He speaks with incredulity of the early part of their journey, which involved crossing the Taurus Mountains. That meant flying at an elevation of nearly 13,000 feet—without oxygen. The Arab villagers who witnessed the crash and saw the bodies and the plane fragments ran to Tzemah to send a telegram to the Ottoman governor of Tiberias. He notified Damascus and Istanbul. The two were brought to Damascus, where they were accorded a state funeral and buried next to the city’s Great Mosque, at the foot of the mausoleum of the Muslim hero Saladin. After a commission of inquiry determined that the plane had not malfunctioned, Ottoman engineers erected a memorial at the site of the crash. It consisted of three parts: a base of stones from the ruins of a Byzantine-era building in Samra, the middle cut from local basalt and an obelisk of reddish limestone topped by white limestone. The story of the brave aviators became an object lesson in Turkey’s Air Force Academy, and the Turkish Air Force Museum displayed the propeller, uniforms and camera from the ill-fated mission. Poems and articles were written in the aviators’ honor. And, in 1934, a city in southwestern Turkey was renamed Fethiye, in memory of the pilot. A statue of Fethi, standing atop massive eagle’s wings, overlooks the harbor. In 2001, a Turkish film, Altin Kanatlar (Golden Wings), re-created the flight, and Fethi’s image appeared on a postage stamp and on a phone card. But the memorial stood forgotten in what had become the fields of Kibbutz Ha’on. Paran, a member of the kibbutz, a historian and an auditor of organizational behavior, became interested in the historic events while working on a landscape survey of the Golan slopes in 1990 as part of his studies at Beit Berl College. In piecing together the story, Paran relied mainly on reports in the Hebrew press, as did Israeli Dov Gavish, the author, in collaboration with Zvi Shilony, of Man-Made Birds on Our Horizon: First Flights over Palestine 1913–1914 (in Hebrew; Yad Yitzhak Ben-Zvi). Both Paran and Gavish point out that aviation was so new that, although the story was front-page news, Hebrew newspapers were hard put to describe the event. The word aviron for airplane was not yet in popular use, and the word matos had yet to be invented. So Hebrew newspapers made do with afifa—which could be understood as flying machine—from the Hebrew root meaning to fly, as a bird does. The pilots were referred to as ha-me’ofefim (the ones who fly). In 1995, Paran turned his attention to the neglected memorial. He began by planting trees nearby. Though they were indigenous, they needed to be watered. “I would go back and forth with jerry cans of water until I got fed up with that,” he recalls. “Then I wrote to the Turkish Embassy and told them there was a memorial here. I waited a long time.” While waiting, he laid a narrow water pipe to the site. A year later, he recalls, the embassy’s aviation attaché asked to see the memorial. Moved by what he saw, the attaché asked Paran to sketch the little garden he wanted to create and promised to try to get some money for it. Eventually, the money came through and Paran used it to build a podium around the obelisk, doing everything himself, by hand. Then he planted additional indigenous trees—Mount Tabor oaks, Atlantic pistachios and carobs—and added just one foreign touch: bougainvillea in red and white, the colors of the Turkish flag. Meanwhile, Gavish, a Hebrew University of Jerusalem expert on maps and aerial photos, invited Bülent Yilmazer, a Turkish historian of aviation, to see what Paran had built. Soon after, in 2001, the commander invited Paran and his wife to Turkey, where the kibbutznik was a guest of honor at the ceremony that launched the filmed re-creation of the flight. Asked by his hosts why he had built the garden, Paran answered simply that the story is an important part of Israeli history. “We were part of the Ottoman Empire,” he said. That same year, after the movie was completed, a Turkish delegation came to the memorial and brought two eagles carved of stone, symbols of the Turkish Air Force. Today, visitors and the Turkish officers who come from time to time to lay a wreath at the memorial see the Turkish flag flying alongside the Israeli flag—no matter how frigid the relations between Ankara and Jerusalem. One memorable moment was the visit, in 2004, of Yilmazer, accompanied by Fethi’s grandniece, Aynur Önuçar. After seeing the memorial, they visited Paran in his home. There, Önuçar showed Paran a relic of her great-uncle he had never seen before: the pilot’s watch. It had stopped at 8:15, the moment of the crash. Paran’s focus, understandably, was on the aviators downed near his kibbutz. But what had become of the other plane that set out from Istanbul? Piloted by Nuri Bey, who was accompanied by navigator Ismail Bey, it had mechanical and other problems from the start. But after the two attended the funeral of Fethi and Sadek in Damascus, they set out on March 9 for Jaffa, en route to Jerusalem, and landed on the beach. Again, there were welcoming crowds, and the aviators were feted at a reception where the liquor flowed freely. According to Paran, a letter written by a woman to her mother in Poland described the aviators as appearing tipsy after the reception, a detail not mentioned in any Turkish sources. When Nuri and Ismail’s plane took off, it flew only a few hundred yards and crashed into the sea. Rescuers were able to save the navigator, but not the pilot. The Ottoman Air Force finally completed the trip to Alexandria on May 15 by sending out a third plane, with pilot Salim Bey and navigator Kemal Bey. They, too, encountered many mechanical difficulties, including a crash that destroyed the plane. They returned to Istanbul and then flew from Beirut to Jerusalem, el-Arish, Port Said and Cairo, where they had an emergency landing, and, at last, to Alexandria. Who could have predicted then that a century later Istanbul would be less than a two-hour flight from Tel Aviv, and that in October 2013, as reported by the online Times of Israel, Turkish Airlines would operate more flights out of Ben-Gurion Airport than any foreign airline? I was a volunteer at Ha-On betweem 86-88, I ploughed those fields & I do remember the Obelisc & was told ‘a Turkish plane crashed there in 1914. Now I know the whole story, top marks to Paran. Hello volunteers of times gone by. I was a volunteer in 1984-1986 and worked mostly in the kitchen in Haòn Kibbutzim. Anyone who was there at that time? I was there from 85 …. with Heather ( Moppy) jock, Mac, Dave , Anni and others. Fantastic times. Mainly in lemons , camping and kitchen as I remember!!! !